I learned something interesting recently: the phrase “Catastrophic Failure” is an actual technical term in engineering. It refers to what happens when a structure, vehicle or machine has some small part that wasn’t built to spec or otherwise was weakened that then causes a domino effect that leads to the whole thing to falling apart. There’s a page about it on wikipedia which includes a list of famous catastrophic failures like the disaster at Chernobyl and the Space Shuttle Challenger explosion. The most recent was the collapse of a the I-85 west bridge going over the Mississippi river. When it happened it was remarkably instantaneous. Despite how large the structure was – it happened in just seconds. This catastrophic failure cost the city of Minneapolis millions of dollars and thirteen people their lives. No one saw it coming. Experts spent months investigating, trying to discern what could have caused the collapse of a seemingly perfect bridge. They were able to determine that it was most likely caused by one faulty joist. 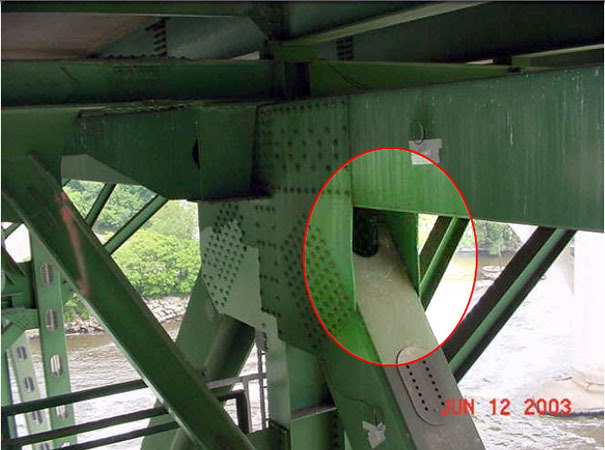 Someone found this picture from four years before that shows a very slight bowing of the joist that may have lead to the eventual and sudden collapse of the entire bridge. When I saw this I thought of all the times that we Christians have some small thing in our lives – some little joist, some little piece that needs attention, but we ignore it – we don’t replace it – we let it sit. I know that there have been times in my life where I’ve allowed a faulty joist to exist. I knew about it, even though no one else did – then one day, boom- Catastrophic Failure. Usually its anger at someone, but it could be many things. The only reason why one doesn’t examine these small things that eventually lead to failure is Pride. My question is what is your faulty joist? What piece in your life needs attention? What needs to be reinforced or replaced? What is keeping you from replacing it? Is it because you may have to seek the help of someone else? I’ve found the only way to strengthen those joists in my own life is to remain humble by being held in honest accountability. the bigger the ego, the harder the fall. William H. Adams does creative work for a church. He enjoys sandwiches, jet skis, legos, ultimate frisbee, and living life to the fullest. Will is most passionate about using creative media to tell the story of what God is doing in the lives of those who love Christ. He believes the purpose of his life to glorify God and encourage others.